Last month during Artista Vista, the annual spring art gallery crawl in downtown Columbia, I ran into the owner of Hip-Wa-Zee, the local vintage clothing shop. The store is a funky place for costumes, used clothing of all sorts, and potential theater props. Within a few moments, we were engaged in a conversation about art, my series, and this idea. This portrait was actually on the "wish list". Fortunately, I carry standard model releases and my digital camera in my purse. 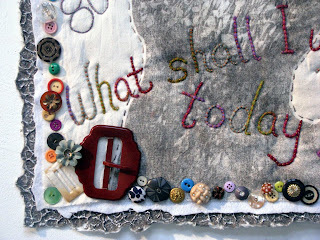 We had a blast taking photos....almost as much fun as I had selecting the vintage buttons to adorn the work. I'm really pleased with the result. 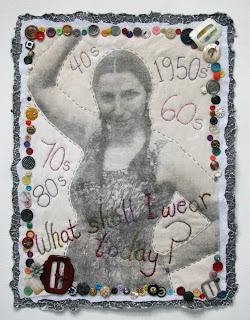 After stitching so many very serious works, it was great to stitch one with color and humor. Best of all, this piece is a physical example of a basic decision we each make every morning: What shall I wear today? Not all decisions are profound and this series is supposed to address all sorts of decisions. There's no better way to focus on this personal choice than this! I love following this series. I like that you have some light-hearted decisions mixed in with the serious ones. GREAT addition. And you are so right...not all decisions are life-altering but never the less, important in their own right. This piece is very different...bright, whimsical, fun. I'm sure it was "soul food" for you too. You know what you need to re-energize and this looks like it did the trick! Great piece! Love this portrait! The fun you had while taking the portrait shows in the photo.